Photograph from B.C. 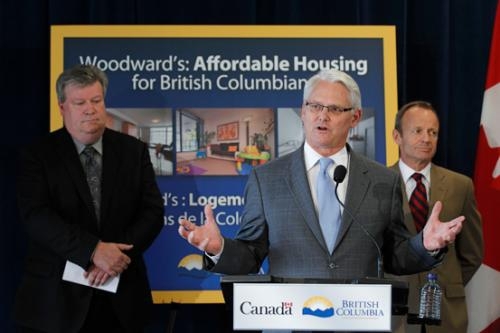 government website of Rich Coleman (left) listening with a downcast look as Premier Gordon Campbell speaks. Rich Coleman is in charge of the Lottery Corporation and Casino licenses. 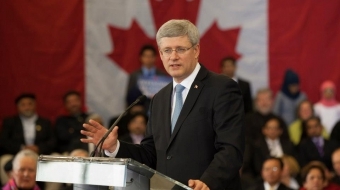 He wants city approval this fall for the BC Place casino development. But what cards does he hold in his poker hand? Rich Coleman is in charge of BC housing and government housing policy. Rich Coleman just rejected all three bids by social housing providers to manage the 252 Olympic Village units, meaning they'll sit empty and the city will continue to bear the cost. "The startling decision on the social-housing operators also has councillors angrily asking why the province appears to be making it so difficult for the city to provide low-cost housing to people who need it, at virtually no cost to the province. Am I the only one seeing hardball being played here? Why do I suspect Coleman is seeking a quid pro quo for Paragon's casino project? It's not like there are other cards in his hand.